More than 50 runners donning Santa Claus outfits and various regalia braved the cold to complete a 5-kilometre course in a bid to stump up cash for charity. Multiple Santa’s from across the site neglected a traditional sleigh and instead ran or jogged a route which started and finished on Farm Way. Around 55 employees from UKAEA as well as tenant companies completed the course to raise money for SOFEA – a Didcot-based charity which seeks to improve the employability of young people. Reaching the finish line first in the 5k event was Paul Lloyd from Reaction Engines with a time of 17 minutes and 46 seconds. He was followed by Ben Drumm of RACE with Rufilla’s Martin Townsend in third place. Sylvia Walus from Oxis Energy was the first woman to cross the line with a time of 24 minutes and 45 seconds. 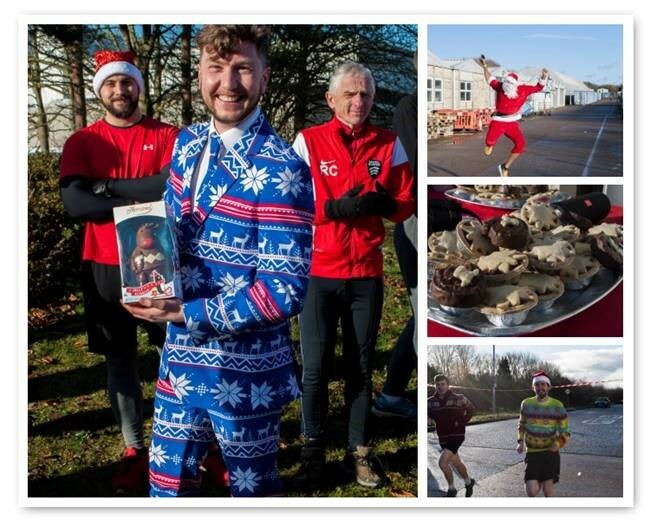 Winners received a bottle of Prosecco to recognise their efforts with the best-dressed runner – Daryl McMenamim from RACE – picking up a chocolate reindeer for his festive blue suit and trousers. UKAEA’s Bruno Viola received the plaudits for the best Santa outfit. SOFEA – which also seeks to reduce food waste – seeks to instil skills and build self-esteem in young people, in addition to looking after society’s most vulnerable with the provision of nutritious food. UKAEA’s Darren Mederick coordinates the QSHE group which organised the event.